BROOKFIELD, WI - (The Comedy News) - In an effort to prevent protests near his office, Governor Scott Walker has relocated the entire Wisconsin State Capitol Building 70 miles east to Brookfield. "This way, all those 1960's liberals can have Madison all to themselves to protest my ideas," Walker said in an AOL Instant Message. "So let 'em protest all they want!" For the past few weeks, there have been consecutive days of thousands of protesters at the lot where the State Capitol square in Madison once stood. 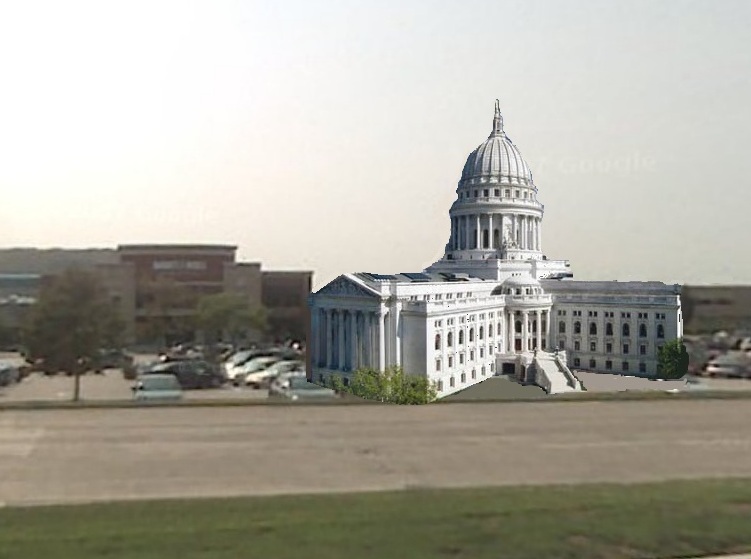 With the relocation of the State Capitol to Waukesha county, it now can be in a more "moderate" region of Wisconsin. Waukesha County voted 62% for McCain and 37% for Obama in the 2008 Presidential Election. Physically moving the 106-year-old State Capitol down Highway 43 to it's present location on Moorland Road was quite a daunting task. The Governor's task force on Capitol Relocation hired 93,000 temporary workers to assist in the engineering anomaly. Of those workers, 20,000 were from firms in Illinois, 50,000 from China, another 20,000 from Minnesota, and about 2,997 from Canada. Only three jobs were created for workers from Wisconsin.